What are 54 Indians doing on the woody hill between the Mount Hacho and Mount Jebel Musa, the African side of the Strait of Gibraltar? Among the conifers in the barren landscape, near a dirt road, old camping tents, Plexiglas buckrams, a worn-out sofa and some old benches are positioned around a creeping fire. 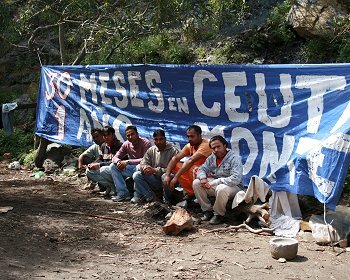 In the background, a blue banner with white writing reads, "Treinta meses en Ceuta, un años en el monte"—thirty months in Ceuta, one year over the hill. Ceuta is an autonomous city with fewer than 80,000 inhabitants that covers an area of 11.5 square miles. A Spanish enclave in the northernmost part of Morocco, it became in the recent past sadly infamous for being a transit point for illegal immigrants to Europe. "After the December 2007 peak," says Dr. Valeriano Hoyos, head of the local Centro de Estancia Temporal de Inmigrantes (C.E.T.I. ), "when the usual migratory flow from the Sub-Sahara and Maghreb area was supplemented by Asians under the control of human smugglers … the situation has improved. Thanks to a rigorous purge of the Guardia Civil, colluded with the racquet, and a better collaboration with Moroccan authorities, today there are not more than three or four clandestine entries per week." Surrounded by parallel twenty-foot fences topped with barbed wire, Ceuta looks more like a jail than a city. "Every day, dozens of Guard ships and patrol boats check the coast, while 621 Guardia Civil’s officers and 548 police officers control the shore," explains the spokesperson of the Delegation of the Spanish Government in Ceuta. On September 29, 2005, the border-fence was assaulted by hundreds of migrants simultaneously, grabbing international media attention. Sprayed by Spanish and Moroccan gunfire, eighteen died and more than fifty were injured. Since then, migrants have been continuing to die in Ceuta, even if there are no international reports about it. The local C.E.T.I. is a modern structure administered by the Ministry of Labour and Social Affairs, comprised of ninety workers for at most 512 migrants. Most of the guests come from Sub-Saharan countries, the rest from Algeria, Syria, India and Bangladesh. Due to the special agreements with their native land, Moroccans who try to come in Ceuta illegally are sent directly back. C.E.T.I. provides technical and welfare services to all asylum seekers. Inside the building there are administration offices, a first-aid clinic, a large refectory, a kitchen, three classrooms, a library, a laundry room, a small gym, a football pitch and several bedrooms, each of which houses eight people—almost a kind of graceful hostel. The administration issues the migrants with a green card that serves as their personal identity document. Without this document, they are not authorized to remain. "The C.E.T.I. is not a jail," Dr. Hoyo specifies, "but, for everyone’s safety, we ask that our internal rules are [respected]. Otherwise, the 'green card' is withdrawn and the unpleasant guest expelled." "On arrival, the health conditions of the patients differ one from another," explains Doctor Sergio Gonzalez Lopez, who has worked in this clinic since 1999, "depending on the various ordeals suffered during the trip—starving, dehydration or ailments of the digestive system caused by contaminated drinking water, not forgetting infirmities for serious strains, long journeys by foot and cruel thrashing inflicted by smugglers or policemen." Stanley, 25, comes from Uganda. He is sitting beside David, 30, who is Sudanese. They arrived in the center two days earlier, through a hole under the trench. In their eyes, one can see the dread. They don’t know whom they can trust; they speak softly, suspiciously. They fled their homelands because of the war, not imagining that the journey could be even worse. David talks of the thrashing and the fraudulence of the smugglers who, promising passage to the E.U., left him and his traveling companions here in Ceuta, not yet European soil, still on the land mass of Africa. Stanley shows the bruises inflicted by the Moroccan police, one for every failed attempt at escape. Mr. Romero Aliaga, lawyer for the Spanish Commission for Assistance to Refugees (C.E.A.R. ), and Mr. Blanch Cardín, International Red Cross, give juridical assistance inside the center. "Every week" says Mr. Aliaga, "we get all the new arrivals together, explaining to them their legal situation, their rights and duties. Then we control by a private interview and a questionnaire the information they have supplied." "The only hope to get into Spain as a non-E.U. citizen," continues Mr. Cardín, "is to ask politic asylum and humanitarian protection, and for this reason most of them lie about their nationality. They usually tell us that they come from Somalia, or some other well-known danger zones, but quickly we realize that they know almost nothing about these countries, for example the currency, the name of the most important cities or rivers." Matthew, 28, standing at the threshold of the room he shares with seven others, comes from Somalia. He says that to be catholic could be a serious problem for him in a region where apostasy—the renunciation of Islam—is punished by death. The C.E.T.I. promotes Spanish courses. The classes are divided according to literacy rate and to the Anglophone or Francophone idiom—heritages from the colonial period. "At the beginning there is much enthusiasm," explains the older teacher. "They feel it as the first step of a new life, but, after a while, when they understand that there is little hope to enter Europe, their happiness inexorably declines." On the wall of the main hall, where the community organizes music and theatrical performances, there is a big white ribbon on which is written in big red letters, "1° Diciembre: Dia Mundial del SIDA"—World A.I.D.S. Day. "It's common belief that migrants carry venereal diseases," explains the doctor of the center, "but usually they are more subject to contracting disease in the country of immigration, because of the strenuous and difficult life conditions that they must face as illegals." "The real problem is the lack of information they have about H.I.V. or A.I.D.S. Obviously, the preaching, ill-timed by some well-known religious authorities, doesn't help at all," confesses Mr. Hoyo, pointing to the basket full of condoms distributed for free by the sanitary staff. "This is why we decided to start courses on sexual education as part of our social program. The results are outstanding, considering the circumstances. The percentage of H.I.V. positive cases is lower here than outside in the city." One year and ten months inside the C.E.T.I., the progressive demolition of dreams are written on the tired, distraught, pessimistic face of Mark, from the Republic of Benin in Western Africa. "Why don’t the authorities give us the 'yellow card?' We are tired of waiting here without a job, doing nothing." "Recently, the Spanish authorities are really restrictive," says Mr. Cardín. "Only 10 percent can obtain the visa and generally these are really extreme cases, as for Iraqi or Kurdish refugees, victims of sexual and religious discrimination, or people needing deep medical treatments not available in their own country. For the others, only repatriation remains." "Until some years ago," continues Mr. Hoyo, "the entry or expulsion procedures were completed within ninety days, and the C.E.T.I. was only a back-up structure, but now there are people who have been living here for more than two years." "Once the governmental authorities can confirm that the migrant does not have requisites laid down by the law for acceptance in E.U. … the next step is the internment inside the special center in Algeciras on the other side of the Strait. Then, if the repatriation is not done within forty days—and it happens often—the individual must be freed there and then, on European soil." For this reason, the Spanish government prefers to leave migrants in Ceuta for as long as possible. Singh has an off-the-book job as a busboy in a small shop in Calle de Real, the main street of the city, making 5 euros for more than ten hours a day. He is one of the 54 guys who have decided to leave the C.E.T.I. and take refuge in the forest. "After the Indian ambassadress visited the city in 2007," says Gurpreet, spokesman for the "rebels," "the situation became ever worse; almost 50 percent of us were repatriated immediately. Thus, as sign of protest, we decide to take shelter to the forest. We hoped to come to the attention of the community, but, as you can see, after one year, we are still here." A long surrounding wall skirts the unpaved road going to the clandestine camp, Villa Sajnani, which is owned by a local well-known Hindu family. Indians are not only clandestine in Ceuta. A small Hindu community of around 700 people has lived here legally for more than a century, having a monopoly of local business and holding companies. "It's nice, isn't it?" whispers Singh, half proud and half dejected, pointing to the balcony that overlooks the wall. "None of us has ever been invited inside." Gurpreet is a graduate of business economy. He reached Adis Abeba in 2004 with a promise of a visa for Europe, but the Ethiopian authorities confiscated his travel documents. So he had to pay for an unauthorized travel organization of migrant smugglers. "Have you ever seen someone dying behind you from starving or effort? Or from the water mixed with petrol and sand with rice?" Pursuing his dream of freedom, after having been a slave in caravan of exiles, sleeping in gloomy and dark jails, he arrived in Ceuta in December 2007. There is no alternative in the minds of Gurpreet, Singh, or Pardeep, who has a wife and two sons waiting for him in his homeland, or for the other 51 over-the-hills. "After all we have had to put up with, we can’t return home empty-handed." "Look at that house on the other side of the sea," says Gurpreet, pointing to the city of Algeciras above the Strait. "That's the Iberian Peninsula. We will move only to go there." Why is their desire to get into Europe so intense? Are they not afraid of the economic crisis? There are no more jobs in Europe, even for Europeans. "We know, we look your T.V. programs every day," replies Smart Jackson, sitting outside the C.E.T.I. "But then we look your dustbin too; you can't call it 'crisis.' We could feed our families for weeks with half of what you throw away." "We don't want your charity," continues Gurpreet desperately, "not your groceries, not your clothes. We ask only for a job that gives us the dignity of a human existence that you are still ignoring." Ceuta is a land for every one and no one, a harbor difficult to approach, practically impossible to leave—434 souls, increasing day after day, living in a kind of "no man’s land," in limbo. What hopes do these refugees have for the future, for integration? "Every morning," says Dr. Hoyo, "the school bus takes the C.E.T.I. 's children to the municipal school." The right to education is guaranteed for them by the Spanish and E.U. constitution, going beyond ethnic background, religion or origin. "We don’t want separated classes; we don’t want to [bring up] ruled-out guys," he replies proudly. How many schoolmates come to visit the place where their colleagues live? "No one, at all; it has never happened." View the Worldpress Desk’s profile for Riccardo Valsecchi.